On November 26 1987, Who’s That Girl – Live In Japan was released on VHS and LaserDisc by Warner-Pioneer Video, exclusively for the Japanese market. 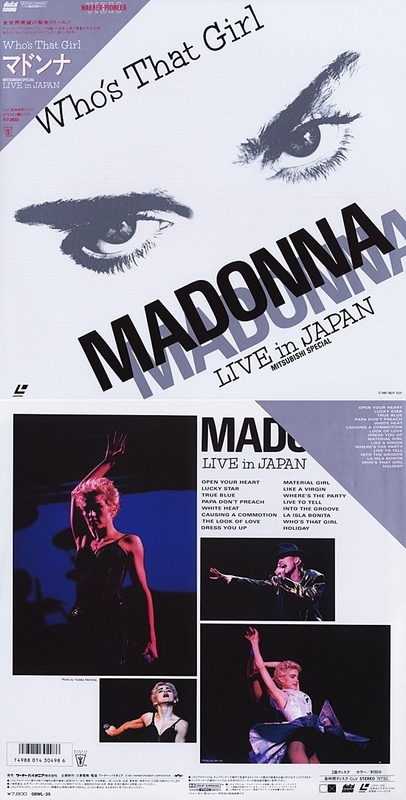 Recorded in Tokyo on June 22 1987, the show initially aired as a television special in Japan in conjunction with Madonna’s sponsorship agreement with Mitsubishi. The special was the first ever television broadcast to make use of Dolby Surround Sound technology. Elements of the Japanese release were also incorporated into the international 1988 release of the Who’s That Girl World Tour, Ciao Italia: Live From Italy, which was also released in Japan on LaserDisc in 1988 and on DVD in 2001. Meanwhile, the complete Live In Japan release has since been deleted from circulation. Recorded and played at the first height of her imperial phase, this live version of Into the Groove, we see a woman and artist-Madonna-increasing and dazzling in confidence!! Soon after, we all knew Madonna could be brilliant! Here she proves it for the first time!! !